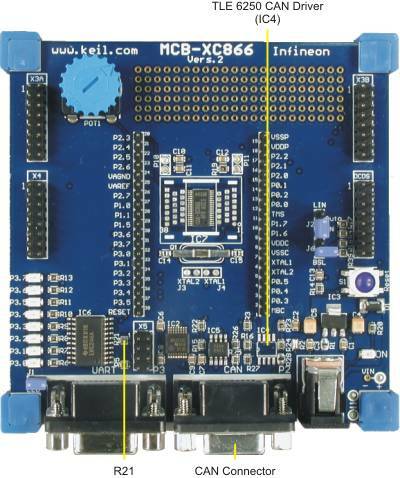 The single CAN interface requires a TLE6250 CAN driver (IC4) and termination resistor (R21) on the MCBXC866 board. IC4 is not populated for the MCBXC866 board. The CAN DB9 connector is wired so that Pin 2 provides the CANL signal and Pin 7 provides the CANH signal. These pins are connected to the TLE 6250 CAN driver IC. CAN termination resistors make it easy to connect the MCBXC866 board to your CAN network but they are not always required. When connecting the MCBXC866 Board to a CAN network, you may not want the termination resistor R21 attached to the bus.